Hey friends! Happy Valentine’s Day to you all! I’m super excited to tell you that today, I’m leaving on a one-week cruise in the Caribbean! What better way could you think of spending Valentine’s Day and my third year anniversary of dating Sean than that? What’s also awesome about this is that for an entire week I’ll have little to no Internet or cell phone access, so I’ll be truly, completely off the grid. But fear not, I’ll be back before you know it and making you totally jealous with pictures of beaches and blue water and warm weather. 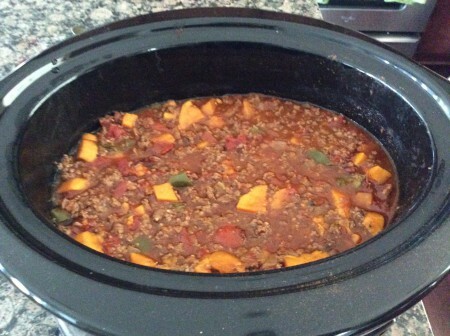 First though, a unique twist on an old classic: slow cooker beef chili with sweet potatoes. Classic chili is something most of us grew up eating: your mom would throw it together, the school would have a chili cook-off or you’d get it at Steak’n’Shake (man, they have some good chili)! But it was always the same basic stuff: ground beef or pork, beans of some kind, ketchup or tomatoes, onions, cheese, oyster crackers or cornbread on the side. Same old, same old and not exactly the healthiest food ever. Anyway, sub in some healthier ground beef, a bell pepper and sweet potatoes for the beans and natural, fire roasted tomatoes and in no time at all, you’ve got gluten-free, paleo-friendly dinner and lunch for the coming week. Full disclosure: I ate this at work for three days in a row and still wasn’t tired of it when I was done (it’s just that good). Try it and tell me you don’t agree. And with that, I’ll see you all soon! I’ll be on a boat! Finely chop the bell pepper and onion. Heat the oil in a large skillet over medium high heat, and add the bell pepper, onion and garlic once the oil’s hot. Saute until the veggies are cooked, then add the ground sirloin and ground beef to the skillet and brown, stirring frequently. This should take 8 – 10 minutes. While the beef’s cooking, peel and cut up the sweet potatoes into bite-sized chunks. Once the beef is done, pour the whole skillet into a 4 – 6 quart slow cooker. Add the sweet potatoes, cans of diced tomatoes, chili powder, creole seasoning, black pepper, onion flakes and paprika. Stir to combine everything. Once the chili’s done, divide evenly among 6 bowls, add cheese and tortilla chips if you want and enjoy. Nothing better than not slaving over a stove and still having dinner ready when you come home. This entry was posted in Entrees, Paleo, Recipes and tagged Beef, Beef Chili, Chili, Entrees, Gluten Free, Low carb, Paleo, Recipes, Sweet Potato, Sweet Potato Chili on February 14, 2015 by Paige N..